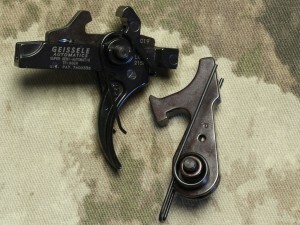 The GEISSELE AUTOMATICS SSA TRIGGER is without question one of the best non-adjustable combat AR-15 triggers you can obtain. Performance Advantages for the Shooter– The Geissele SSA has a pull weight of about 4.5lb. 2.5 lbs on the first stage and 2lb on the second stage. The pull weights and sear engagement are non adjustable by the shooter. Trigger and hammer are made from quality tool steel. Sear surfaces are cut by a wire edm machine. Sears cut this way are very accurate and the non-directional surface finish of the wire edm gives a smooth trigger pull without the associated grittiness of directional machining marks left by a milling cutter. The initial force needed to start the disengagement of the sear surfaces is low and the force linearly increases at a low rate. This helps the shot to fall at the initial point of aim and aids in building shooter confidence in his weapons ability to put the rounds where his sight is pointing. The Geissele SSA trigger allows the shooter to slap through the trigger pull on close in shots but also set up a long range shot with a crisp trigger break. A full force hammer spring is used for quick lock time and positive ignition of all types of ammo. No lightened hammer spring is used. 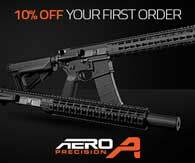 The hammer is lighter than a standard AR15 hammer. The lightened hammer favorably decreases lock time and increases accuracy of the weapon, especially for snap shots. Advantages for the Armorer – The Geissele SSA is a simple design that is very similar to the original M16 trigger. The number of parts is identical. There are no adjustment screws to come loose. All springs are captive; they will not get lost during disassembly in the field. The entire trigger can be dissembled for cleaning (no rivets or staked parts) The trigger can be installed without removing the safety. Sear engagement is preset from the factory. Hammer and trigger pins are a close slip fit into nominal receiver holes so the trigger can be installed and removed with hand tools. Triggers come with a slave pin for the trigger/disconnector assembly for easy installation. Safety Advantages – The Geissele SSA is a 2 stage trigger where there is generous overlap of the sear surfaces which contributes to safety and a low tendency of any inadvertent movement of the trigger to discharge the weapon. The Geissele SSA has a patented pseudo sear that is almost identical to the standard AR15 single stage sear. However, this secondary sear has surfaces that never touch during normal operation. This sear prevents the hammer from falling unless the trigger is pulled. The secondary safety sear contributes to shooter confidence in dynamic/vehicle situations where a fellow shooter’s muzzle may cover him. There is firm knowledge that even with the safety in the fire position the weapon can never discharge unless the trigger is pulled. Trigger timing is robust and parts have been sized to operate with a certain amount of wear to the working surfaces. The trigger is designed to operate in dusty, abrasive environments that cause wear.